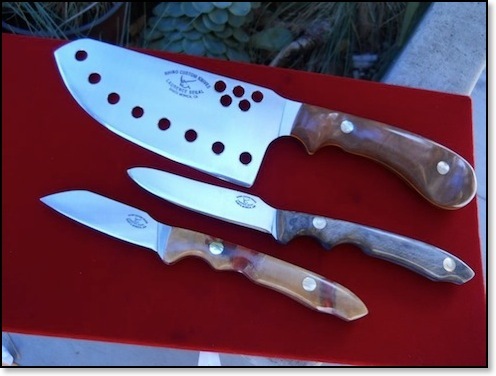 Laurence Segal, maker of Rhino Custom Knives, was influenced by both aboriginal Inuit knives and traditional Chinese cleavers in his design of the Rhino Chop. Laurence has combined elements of the Chinese cleaver (or chef's knife) and of the ulu, an all-purpose knife traditionally used by Inuit (Eskimo) women. The Rhino Chop incorporates various elements of the curve and the depth of the blades, the heft and balance of the whole implement, and the sturdiness of both the ulu and Chinese cleaver (chef's knife). An ulu is an Inuit all-purpose knife used for numerous jobs - jobs as wide ranged as skinning and cleaning animals, cutting a child's hair, cutting food, and trimming blocks of snow and ice for building an igloo. The photo above is of an Alaskan ulu. In the past the ulu was made with a caribou antler, muskox horn, or walrus ivory handle and a slate cutting surface, because of the lack of metal in the Arctic. The handle could also be carved from bone, and sometimes wood. In certain areas copper was used for the cutting surface. 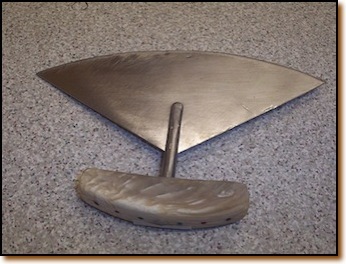 The size of the ulu naturally reflects its use. An ulu with a two inch blade would be used as part of a sewing kit to cut sinew. A general purpose ulu had a six inch blade. A large ulu could range up to a foot in length. The ulu comes in two distinct styles, Alaskan and Canadian. 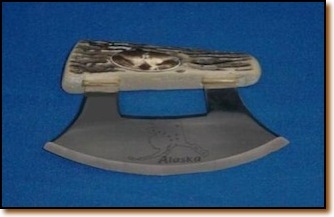 The Alaskan style ulu, shown above, has both sides of the blade fitted into the handle. In Canada the blade is more often is attached to the handle by a single stem in the center (as shown here). This Canadian ulu has a metal, rather than slate blade, fashioned from a saw blade. Ulu knives have been found that date back to as early as 2500 BC. The shape of the ulu ensures that the force is centered more over the middle of the blade than with an ordinary knife. This makes the ulu easier to use when cutting hard objects such as bone. Because the rocking motion used when cutting on a plate or board with an ulu pins down the food being cut, it is also easier to use an ulu one-handed (a typical steak knife, in contrast, requires a fork). In the illustration above the Chinese cleaver, or chef's knife, is at the top. Below it is an older North American butcher's cleaver, used for chopping bones. It has a much heavier blade. 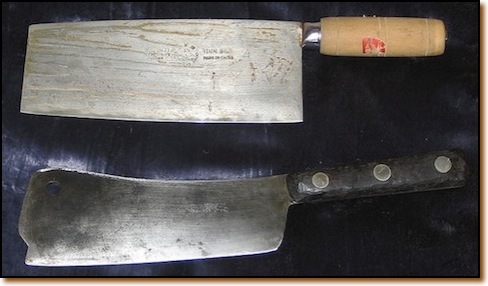 The Chinese cleaver is used for slicing, chopping, and mincing vegetables, fish, and boneless meat. These are the tasks for which the Rhino Chop has been designed.